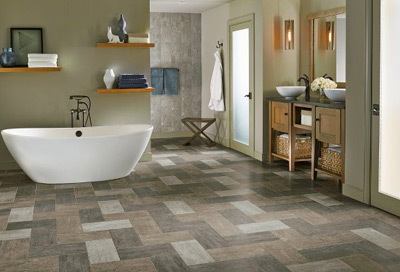 Porcelain tiles are always thought to be a good choice for your bathroom flooring. Not only do they offer durability, they also add real beauty to your washroom. You can achieve a rich, solid feeling without spending much. They come in all sizes, colors and textures. All you need is to hire the right contractor to install them with utmost efficiency and accuracy. You can also consult with Ensuite Bathroom Renovations, the top leading renovation company, to get the best advice regarding your bathroom flooring. Stone flooring can be a little expensive. If money isn’t the issue for you, go for it. Not only does it give a new touch to your bathroom, it also increases your home’s value. That’s probably one of the best flooring options you can go with. They come in all sizes, shapes, colors and textures. You find a huge range of options to choose from. Vinyl flooring is very easy to install and can last longer if you take good care of it. If you want to achieve a natural wood feel in your bathroom, consider investing in engineered wood flooring because it’s the best thing your money can buy. Want to add your own experiences? Please feel free and don’t hesitate to share your thoughts with us.